A man made a unique proposal video for his girlfriend that took her by surprise on her birthday. Dean Smith of Scottsdale, Arizona had been secretly proposing to her everyday for a year, exactly 365 days, and made a video of each proposal. Compiling all the videos of each proposal, Smith had been wanting to prove that she had always been in his mind everyday. On her birthday the previous year, Jennifer Kessel had no idea that her boyfriend finally decided to ask her hand for marriage. The video had shown Smith in various attires, doing various things in his everyday life, playing with a cat or a dog, and in different places, all with one thing in common. 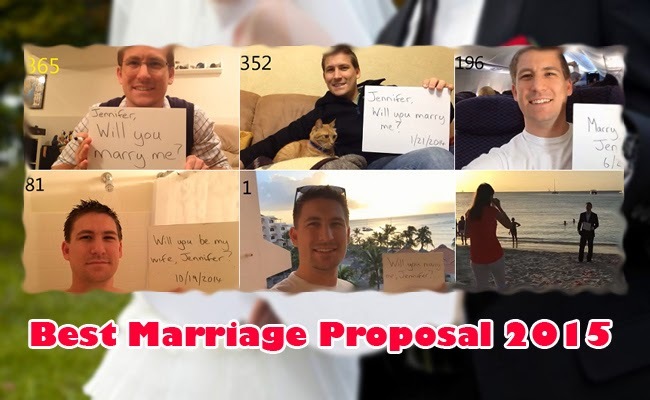 In each clip, Smith had been holding a small white board with a message asking Jennifer to marry her. The message varies a little, it sometimes asks her to ‘make him the happiest man’ or if she would be his wife. Sometimes, other family members would hold the message for him while in other clips, only the dog was shown with the board. After 365 days, it was again Jennifer birthday and the surprise was ready. Smith had Jennifer’s younger sister deliver her a message in a whiteboard. It says that she must head to the lobby where her brother was also holding a board saying that she should head to the resort’s bar. At the resort’s bar, her father and step mother had been waiting for her and handed her a device which she had used to view the video Smith had been working for without her knowledge. In between clips are her views taken by Smith through out the year. At the end of the clip, the view told her to turn around. She then saw Smith holding the white board, asking her to marry him as the sun sets in Aruba. She said yes and the family had surrounded them with warm hugs and love.